Mrs. Betty Ellington was a blue haired old woman with a heart of gold. A member of my church and a wonderful pianist, she was also my eighth grade English teacher. To say she loved English would have been an understatement. She lived and breathed English. She wanted the students in her class to love English and to respect it. Like an Army drill sergeant, Mrs. Ellington worked hard to help us grasp the concepts of the English language. Parts of speech were her life. She especially adored prepositions. It's hard to believe, after 45 years, I can still recite most of the 48 prepositions we were required to memorize in her class. Today, as I was thinking about that long list of prepositions, my focus narrowed on the word, through. I'd recently done a Biblical word study on the word abar, a Greek word meaning through. Abar, pronounced Awbar, is an action word indicating movement. The Hebrew Greek Key Word Study Bible points to Strong's concordance which says abar is a verb meaning to pass over or through, to go beyond, to pass away or leave. I like that. When I began writing my breast cancer blog, I named it Journey Into Pink. After I completed treatment and began learning how to live my life on the other side of cancer, I moved my posts to a new blog. I named that blog Journey Out of Pink. The name for my current blog is significant and reminds me I'm no longer stuck in the middle of the breast cancer world, I'm moving through it. Through - a word indicating movement, how appropriate for a Christian's life. God doesn't want us to stay in one place and fail to grow. He also doesn't want us to remain stagnant and die. He wants us to thrive. And that's where I am currently...learning to thrive. Thrive is a verb, another action word. It indicates doing well, prospering, and growth. For me, it indicates progress. It means I've learned to move from letting cancer dictate every aspect of my life to forgetting what's in the past and pressing forward toward the goal of living life and living it well. I'm sure Mrs. Ellington would be happy to know prepositions have become such a vital part of my life. I'm thankful she was not only a kind and caring teacher but also a woman after God's own heart. 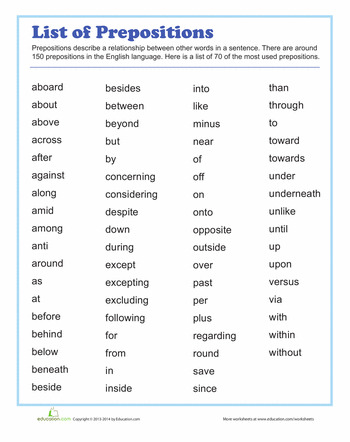 You may have noticed I put some of the prepositions in this post in italics. I wanted to draw your attention to them. 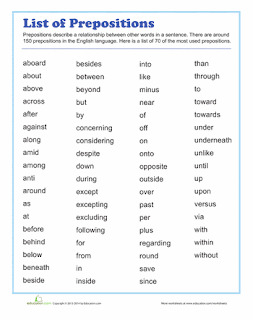 Maybe you have one or two prepositions that are special to you! I know I do.